Come join the challenge at the Die Cut Divas. This months theme is Anything Goes and our fantastic sponsor is Kaisercraft! Hope you all join us. Here is a look at the prize - valued at $50 Australian. This large feather die was a dream to work with! It is also a new release, so be sure to look for it sometime in June. The feather Kaiserkraft paper is out of the Periwinkle Collection, Morning Light. 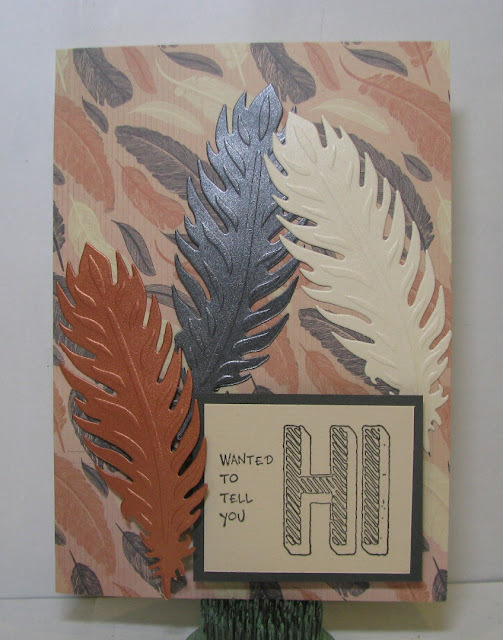 The feathers were made out of Wausau shimmer paper, except the cream one was from DCWV Shimmer Paper stack. The sentiment is an old Studio G stamp that was on clearance for 50 cents, and this is the first time I've used it. The sentiment papers are from my scrap bin.